The Honjo International Scholarship Foundation is pleased to offer The Foreign Student’s Scholarship (for graduate students) to foreign students to attend a graduate school at a Japanese university. The scholarship is also known as Honjo International Scholarships. It is mainly provided to foreign students who study in Japanese graduate schools on the purpose of earning doctoral degree. Honjo International Scholarship Foundation provides scholarship to bright students who have the potential to become outstanding leaders to contribute to the peaceful development in the global community. Awards are available for either local Japanese students (i.e. The Japanese Student's Scholarship) or for foreign international students (i.e. The Foreign Student’s Scholarship). All applications are submitted as from September 1 up until October 31, 2016. The student does not possess Japanese citizenship. The student must be registered to attend or applying for a graduate school starting from April 1, 2017. To be eligible, students enrolled in a PhD Program must have been born after March 31, 1981. Those enrolled in a Master’s Program must have been born after March 31, 1986. Scholarships are available for pursuing graduate level programs (Master and PhD) in any course offered at a Japanese university. The period of the Honjo International Scholarship is set in accordance with the shortest period of time required to complete the intended degree. An extension will not be given on the pre-determined scholarship period nor would the student be allowed to change his or her courses after the scholarship period has commenced. Those whose enrollment period is shorter than one year are not eligible to apply. The student, once awarded the scholarship will be able to choose the option (1), (2) or (3) as below. Download the "Guidelines for Application" found on the official website, and check to see if you are eligible. Fill in the “Online Application” to obtain your application number. Your Application Number will be sent automatically to your email address that you confirmed on the Web Application. Please make a note of the number as you will need the number when results are announced. Download all the applications as found on the official webpage and fill in the forms out in Japanese. (If your name or your current address cannot be translated into Japanese, please write these down in English). Please make sure to write down your application number at the right corner of each form and send them to the Administration Office including all the required documents as stipulated in the “Guideline for Application”. It is important to visit the official website (link to it is below) for complete information on how to apply for this Scholarship, and to download the "Guidelines for Application" and "Application Form". The Honjo International Scholarship Foundation has been established to provide scholarships to bright students who are struggling to study under different conditions in developing nations as well as to those Japanese students studying abroad, to help them learn advanced technologies and improve their good intentions as this will serve as a bridge connecting Japan with the rest of the world in culture and mutual friendships. The scholarship recipients are under no obligation to repay the amount they receive from the Honjo International Scholarship Foundation. 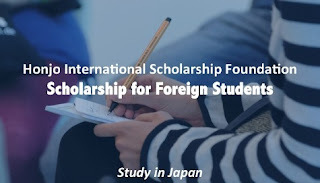 The student is not permitted to receive any other scholarship in conjunction with the scholarship offered by the Honjo International Scholarship Foundation. Hello @Unknown this is the link to visit so that you can get complete information and apply to this scholarship: http://hisf.or.jp/english/sch-f/index.html. Remember to apply before the advertised deadline. Wish you luck as you apply. Is this an annual scholarship ? I've just seen the announcement and i've already passed the deadline ! All the forms (Application) are in Japanese. How a foreign student can apply for this scholarship? Provide a solution. Thanks in advance.